There’s an enclave of London – a city that sprawls upwards and outwards with shards of gleaming new buildings and the domes of much older ones – which is characterised by no singular feat of architecture. There were no laws passed here, nor battles won. There is no palace or great bridge on which to hang its hat. Yet what this patch of the capital, nestled between Edgware Road and the Westway, does boast is a key network of canals. This is where the Regent’s Canal meets the Paddington arm of the Grand Union Canal, and it is this that has earned the area the name Little Venice. Unlike its Italian namesake, there are no gondolas here, but Little Venice is surely up there with some of the prettiest parts of London. Beautiful Georgian houses stand tall and ornate like giant wedding cakes, complete with elaborate ‘buttercream’ stucco facades. And on the water below, residents of multi-coloured houseboats bustle about their business. Little Venice is just a few minutes from Paddington, one of the busiest train stations in the country, yet it can feel almost rural here. If you look at the map, there is not only plenty of water, but also a high concentration of green space. These areas denote the hidden gardens belonging to the mansion blocks that line the likes of Lauderdale Road and Warrington Crescent (the latter is home to the Colonnade Hotel, a former hospital in which Enigma code- breaker Alan Turing, played by Benedict Cumberbatch in 2014 film The Imitation Game, was born). Although these spaces aren’t open to the public, they give an insight into whom the area was designed for, and explains in part why it is considered such a gem today. There are plenty of trees, long avenues, and a café culture. There are independent wine shops and bistro chairs outside restaurants. 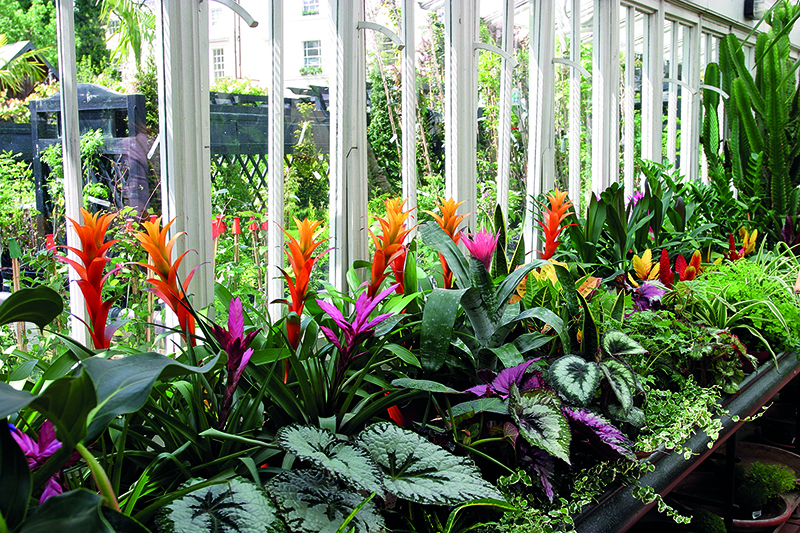 Window boxes are well watered, cars are expensive and clean, and paintwork – on boat or building – is fresh. This is a pristine, Mary Poppins-esque vision of London. Although Little Venice is now a tourist photographer’s dream world, this vicinity hasn’t always been such a model of middle- class respectability. Back in 1801, when the Regent’s Canal (named after the Prince Regent, later King George IV) was first built as a means of making it easier to transport cargo across the capital, the area was no more than a rather grimy suburb of London. The waterway soon changed that, as houses and roads soon began to spring up – and not just any old bricks and mortar either. Houses by celebrated Regency architect John Nash lined the canals – and what was once a non-descript place became a home for the upper classes. However, the area wasn’t exclusive to the gentry. Below on the water, boatmen and their families lived cheek by jowl in less than comfortable conditions. Many of the houses have been lost over the years, with historians pointing out that the area’s heyday came in the 1930s, when the canals were far less crowded. Little Venice was also not immediately labelled as such. In fact, it wasn’t until after the Second World War that the name began to be widely used. Who first coined the name is widely debated, with plenty of people believing it was the celebrated Victorian poet, Robert Browning, who lived in a house at what was 19 Warwick Crescent from 1862 to 1887. His house no longer exists – it was demolished some 70 years ago – but a memorial sculpture,Two Doves, stands at the west end of the Crescent, symbolising “peace, love and learning”. However, while the story persists, there is no hard evidence for this: there is literally no correspondence in which Browning refers to Venice at all. 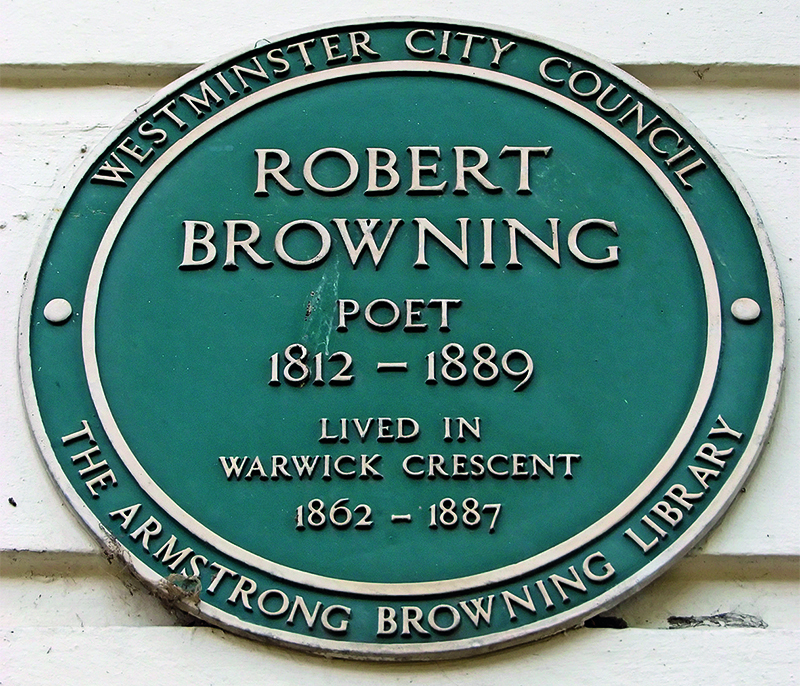 Plaque marking a home of poet Robert Browning. It is likely that people jumped to the conclusion that Browning was the one who gave Little Venice its name because of Browning’s Pool – a large intersection where the Regent’s Canal meets the Grand Union Canal, in the middle of which sits a small patch of land populated with ducks, geese and weeping willow trees known as Browning’s Island. As a person of such import and renown that parts of the area were even named after him, it follows that Browning named Little Venice, right? It was, in fact, Lord Byron who compared this patch of W2 with Venice in the mid- 1800s. The Romantic poet revealed London to be very much a poor man’s version of Italy’s eye-poppingly romantic equivalent. It would be the best part of a century before Little Venice had developed the kind of beauty that could justify such a commanding name. One of the loveliest things to do here is simply watch the boats go by. Names such as Golden Buoy or Esmeralda are as evocative and delightful as their aesthetic can be, as boat roofs heave with pots of geraniums, watering cans and pets lazing in the sun. If you think houseboats are the sole domain of bohemians who want to save a few quid on rent, think again: Sir Richard Branson has a houseboat moored at Little Venice. He perhaps has fond memories of being such a bohemian though. Branson bought his first boat, Duende, when he moved to London and lived on it at Little Venice during the early days of his Virgin empire in the early 1970s. “Some of our happiest days, and greatest business deals, took place on the houseboat,” he said. In 2016, Duende was replaced with a stylish new boat. Moored next to chic canalside restaurant, The Summerhouse, it’s a pale beauty with dark detailing around the windows – an echo, perhaps, of the architecture that overlooks it – and it is in far better condition than most landlubbers’ properties. Word on the Water, London’s only waterborne bookshop, would previously moor here on regular occasions, though owners Paddy Screech and Jonathan Privett have found a permanent home further down the canal near King’s Cross. Packed full of new and secondhand books, it is charm defined and worth the short detour. Depending on the time of year and its schedule, you might also see the Puppet Theatre Barge – with its distinctive red and yellow striped awning. As its name suggests, this 22-metre long houseboat presents traditional puppet shows inside on a specially designed stage and has done for 30 years. Although the boat doesn’t move during the performances the experience of going to the theatre via a gangplank is unusual and not to be missed. Each May bank holiday weekend, the area’s history and boating credentials are celebrated with the Canalway Cavalcade (4-6 May 2019). 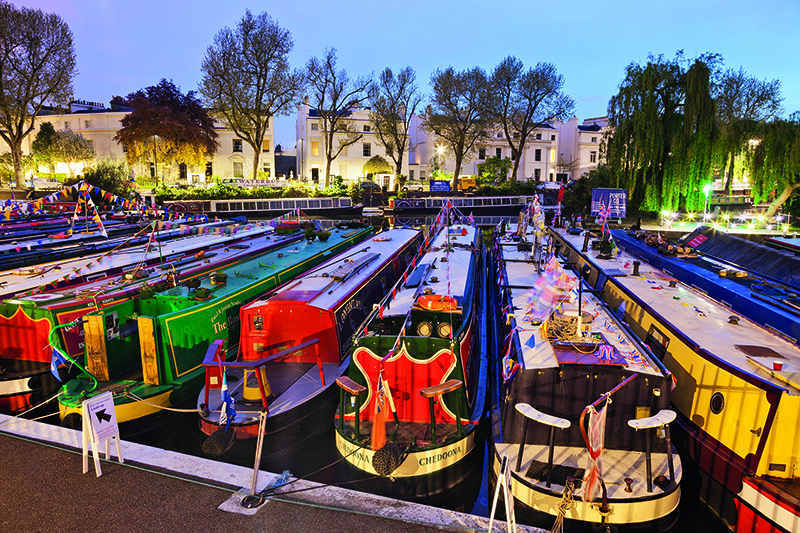 First held in 1983, this Inland Waterways Association festival sees more than 100 barges from across London and beyond gather in Browning’s Pool, the more open stretch of the Grand Union Canal between Blomfield Road, Warwick Avenue and Warwick Crescent. Typically, the boats are decorated with bunting, live music plays, and the canal towpaths are lined with trade stalls of street food. The true hidden gem of Little Venice is Clifton Nurseries. Accessed down a narrow pathway between two Regency properties, it is an urban paradise for anyone who considers themselves even a tiny bit green fingered. While you’d be hard pushed to find a gnome here, this is far more than just a garden centre. There’s Quince Tree Café serving delicious brunch, lunch and afternoon teas, and a conservatory housing an impressive array of cacti and succulents – as well as a resident black cat that can be found snoozing among the planters. 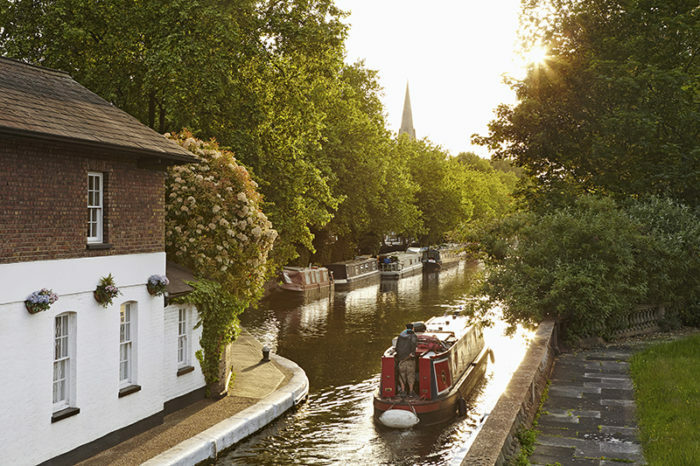 While walking is the easiest way to explore Little Venice – it’s so small you’d only be meandering for a couple of hours – it would be fitting to explore by boat. The London Waterbus Company, Jason’s Trips and Jenny Wren at Walker’s Quay all offer tours that serve to showcase the area and its quirky history.